Every other October, farmers, food crafters, and food advocates from around the globe converge in Turin, Italy, for Slow Food International’s biennial gathering, Terra Madre, and the accompanying Salone del Gusto. Among them last fall were Ferry Plaza vendors Bryce Loewen of Blossom Bluff Orchards, Luisa Alberto from Sōw Juice, and Grant Brians of Heirloom Organic Gardens. The three were selected to attend as U.S. delegates, with financial support from Slow Food San Francisco and from CUESA’s seller scholarship program. CUESA staff member Cindy Mendoza also attended. Here are some of their reflections from the conference. It’s been a couple months since I returned from Terra Madre, and I’m still glowing from the experience. My parents were asked to be delegates 10 years ago at the first Terra Madre conference, so I had some idea of what to expect, but like so many experiences in life, you just have to be there to really get it. The event takes place in Turin’s massive Olympic Stadium. It housed a total of 1,266 exhibitors and was attended by more than 220,000 visitors over five days. The Terra Madre section featured booths from all over the world, and you could find everything from Slovakian smoked cheese to fresh Norwegian oysters to Canadian maple syrup. The Salone del Gusto section was strictly Italian, and it was broken up into the various regions of Italy. Cured meats, wines, and olive oils were abundant, and there was also plenty of bread, gelato, chocolate, and craft beer. I was exposed to flavors I’d never experienced before, as well as familiar foods that were prepared or preserved in ways I’d never dreamed of. As amazing as the food was, the most powerful part of the experience for me was meeting so many people that are passionate about real, traditional food. I met farmers, ranchers, chefs, and urban gardeners, many of them occupying several of those titles, and all of them falling under the umbrella of food activist. There is something both humbling and emboldening about being in such a large group of like-minded people that are from so many different parts of the world. There’s an infectious feeling that our values matter, and that we have the power and the responsibility to spread those values. I came away from the conference with a ton of new friends, and the absolute belief that, with a little effort, we can form a net of food awareness that will encompass the globe and effect real change. It’s hard to express the potency of this feeling. As a U.S. delegate at Terra Madre, I had the rare opportunity to connect with the people, stories, and traditions that feed the diversity and splendor of an international community united by food. It was both overwhelming and humbling. Between expert panels, tasting workshops, impromptu dinners, and a giant Ark of Taste (a living catalog of delicious and distinctive foods facing extinction; see photo above), there was always an opportunity to indulge. One highlight: The consolidated UNISG (University of Gastronomic Sciences) Slow Food convivium project involved expert students taking you around the Salone del Gusto to discover, learn, and shop intelligently. We chose the international track and explored Maghreb, a region of Northwest Africa that I knew close to nothing about. Along the way I discovered and brought home an incredible honey from Egypt’s wandering beekeepers that tasted as remarkable as the ancient story behind its making. Its perceived value and specialness increased with every detail of its story. Learning about a food’s origin makes us appreciate and respect it more. This is how I want to eat and this is how I want to make food for others. In my business, Sōw Juice, our products embody the diversity and specialness of our local agriculture. We only serve California-grown juice combinations highlighting in-season produce, herbs, and flowers. Since we make and serve everything to order, we have the opportunity to establish a connection with each of our customers. We can be a conduit for the stories behind the varietals we source and the farmers we talk to every day. Our next project is to identify California-grown produce in the Ark of Taste to include in our seasonal juice combinations so that more people have the opportunity to taste these local treasures and incorporate them into their daily diets. Our hope is to help preserve these varieties’ stories and our food culture for generations to come. Terra Madre is not like any other convention I have been to. I went expecting to meet people from all over the world, and lo and behold, I did meet and have interesting and useful conversations with people from each continent except Australia! But aside from going with an open mind to try and learn as much as I could, I had an overarching goal: find seeds of interesting heirloom vegetable and herb varieties to bring back to our farm and to your tables. To my surprise, there were very few vegetables being served or sold at Salone del Gusto, so my son, Coy, and I ventured into the markets in the old town. The retail produce market had bananas from the Caribbean and fruits and vegetables from the large companies all over southern Europe, Africa, and the Middle East, almost all of them modern hybrids. But we also found an organic-only farmers market, where real farmers were selling traditional varieties of everything from romanesco to polenta corn to spinach. The selection was small, but the flavors were terrific, and the farmers had a real connection with their customers just like we do. Back at Terra Madre, I found heirloom runner beans from Romania and will be testing out the seeds for local use back at my farm. I also found heirloom beans from the Treviso area near Venice, orange-colored polenta corn from near Torino, and Ark of Taste onion varieties. I found a Brazilian rice farmer who I am connecting with a friend who grows rice here in California. The Brazilian farmer grows a red rice variety I think some of our local chefs would like. As those who know me can attest, I have no trouble talking to people. As a result, I ended up giving an impromptu talk on organic certification and how to make it work better for indigenous Third World farmers. My history in the organic farming movement and certification stretches back to the mid-1970s, and that came in handy. In short, I now have even more investigations and research to do as a result of our trip to Terra Madre. I look forward to continuing the friendships I made, and I hope to bring even more interesting and tasty crops to my home of Northern California. 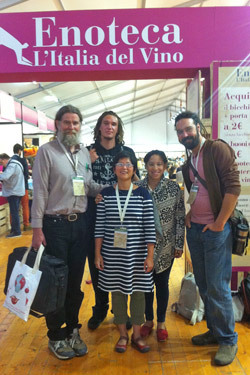 I’m grateful for the exciting opportunity to attend Terra Madre and Salone del Gusto. Enlightening exchanges with past attendees couldn’t have prepared me for the poignant impact of the conference itself. It was an incredible once-in-a-lifetime chance to connect with food producers from around world who shared the same values to provide clean, safe, and fair food for all. This year marked 25 years of Slow Food and 10 years of Terra Madre. The opening ceremony set the tone for the conference. I was humbled and amazed seeing the parade of flags from more than 150 countries and the diversity of delegates in their colorful traditional dress. Over the next five days, I kept being reminded of the role each of us plays in this global food movement. Among the speakers who shared their stories at the U.S. delegation meeting, chef and sixth-generation farmer Matthew Raiford spoke about returning to his hometown of Brunswick, Georgia, to work the land his family had owned since 1874. Third-generation fisherman and New Orleans shrimper Lance Nacio shared his journey converting to more sustainable practices after connecting with his local Slow Food chapter. Fourth-generation hog farmer and Humane Society Vice President Joe Maxwell called on U.S. farmers to lead the global Slow Meat movement and reverse the industrial model that American corporate operations have spread. I had many more opportunities to get to know my fellow delegates while tasting regional Italian cheeses, salumi, and sweets, visiting the Turin farmers market, and taking a white truffle adventure in Alba. I also met Burkino Faso cheesemakers, Ugandan coffee growers, and an old Filipino chef friend. Inspired by stories from farmers and food makers near and far, I left Turin fully sated and ready to continue the global work of Slow Food back home. Support CUESA’s seller scholarship program by donating today. Pictured above: Grant and Coy Brians, Cindy Mendoza, Luisa Alberto, and Bryce Loewen. Ark of Taste photo by Luisa Alberto.